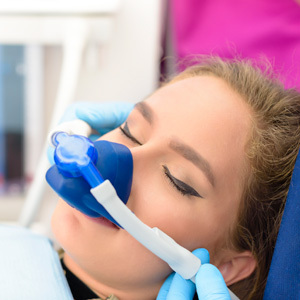 Happy gas (also known as nitrous oxide or laughing gas) is an effective form of sedation that allows anxious patients to undergo treatment in a very relaxed and euphoric state. Not only can it instantly ease a patient’s nerves or feelings of panic, but it is a highly successful form of pain management, suppressing senses such as hearing and touch. Our team of oral health care professionals are qualified and trained to administer happy gas for a wide range of procedures, including fillings, root canal therapy, dental cleans, and more. How Does Happy Gas Work? Happy gas is inhaled through a mask and it is safe to use on the majority of patients – including both children and the elderly. Once the patient has breathed in the happy gas for a few minutes, it will begin to take effect. The patient will find themselves in a highly relaxed, sedative state, allowing our dentists to commence the procedure. Although happy gas is a sedative, it’s important to mention that the patient is in fact not asleep. They remain conscious during the procedure and our dentist is able to converse with them throughout. To find out more about our happy gas dentistry, or to schedule a consultation with one of our friendly dentists, please call (07) 3883 2434 today!